Many people know that Niagara is the honeymoon capital of the world but there are many more interesting facts about Niagara Falls than just that. For example, did you know that there are three separate falls that constitute the Niagara Falls? 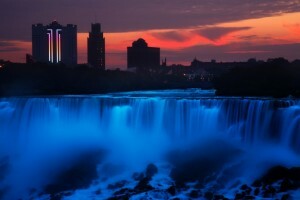 Did you know that there is a city called Niagara Falls in both Ontario, Canada and New York, USA? Niagara Falls has something for the conqueror, scientist, record keeper, historian and engineer. Although it is illegal and extremely dangerous to go over the Falls, several people have tried it. The first one to do so successfully, or without being killed that is, was a 63 year old female school teacher who used an empty barrel. Several people have tightrope walked the Falls including the first person in 1859 and the most recent in 2012. The tightrope walker in 2012 received permission from the governments of both Canada and the U.S. and presented his passport upon landing on Canadian soil to make it a legal entry. The Niagara River itself is estimated to be only 12,000 years old and will erode completely within 50,000 more at the current rate of erosion. It was formed by glaciers two to three kilometers thick that gouged out the great lakes and left massive scoring in their wake when they receded. During the winter, the river can appear to completely freeze over — but this is actually the accumulation of condensed and frozen mist that can build outwards from the banks to form a bridge of sorts. In the past, this ice bridge became so strong that tourists were allowed to walk on the ice. The three waterfalls of Niagara Falls put together produce the highest flow rate of any waterfall on Earth at a grand total of 2,839,058 liters of water per second. This is of course an average flow since the actual flow fluctuates constantly due to a variety of factors. The factors include time of year, time of day and the amount of water diverted for hydroelectric usage, among other causes. These falls are also the second largest in the world behind Victoria Falls in South Africa. During the Anglo-American War of 1812 the Battle of Lundy’s Lane, also known as the Battle of Niagara Falls was fought in the area. It was one of the deadliest battles ever fought on Canadian soil and one of the bloodiest of the war. Even though the casualty count was relatively similar between the armies, the British won a strategic victory. American forces initially took and held the high hill upon which British cannon had been placed. However, the Americans abandoned the position to a numerically superior British force. However, the battle proved that American forces had evolved into a highly professional army within a relatively short time. For further study the War of 1812 Museum provides a wealth of information for any who seek to visit. Hydroelectric power has been utilized at Niagara Falls since 1759 and currently generates 2.7 million kilowatts in the U.S. and 2.338 kilowatts in Canada. The first use of the power was by Daniel Joncairs on the American side, who powered a small sawmill via waterwheel. Currently, there are five power generation stations in Canada and two in the U.S. Altogether these generating stations produce more than one-fourth of all power used in Ontario and New York. For more information or to learn about touring modern or retired facilities you can look here.